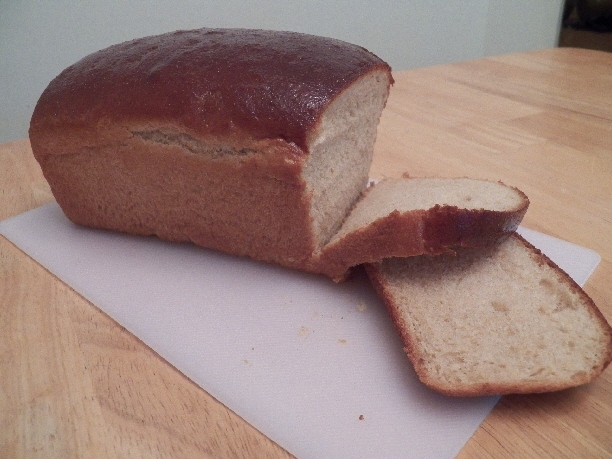 Slice and serve this 100% Whole Wheat Amish Friendship Bread for your next lunch buffet. In a stand mixer bowl, stir together warm water, honey, and yeast. Let sit for about 10 minutes. Next, add starter, oil, eggs, salt, wheat gluten, and 4 cups of the flour and mix. Gradually add remaining flour until the dough pulls away from the side of the bowl. While dough is in the mixing bowl, knead for about 8 to 10 minutes. By the time the kneading is over, the sides of the bowl should be clean. Let dough stand about three hours (or until doubled) at room temperature. Finally, punch dough down and divide into three equal balls. On a floured surface, knead each ball, shape into loaves and place into greased loaf pans. Cover and let stand about two hours or until risen. If this bread is too sweet for your taste you can half the amount of sugar added to Day 6 and Day 10 of the starter. This change will not affect the baking of the bread. You can also freeze one cup of starter on Day 10, take it out, thaw it, and bake with it whenever you need more bread. This is a wonderful recipe. Cutting the sugar to two tablespoons instead of 1/4 cup gives just enough sweet for everyday bread. Also, I use 3 c. whole wheat bread flour and around 3 c. regular whole wheat flour. My husband used to be the dedicated bread baker, but this recipe has changed that! I also did half and half on the flour, and I added some instant coffee and some cocoa like another wheat bread recipe that I’ve done before. It turned out great and made a loaf and a pan of rolls in a muffin tin. This is a great recipe! I followed Bessy’s advice and used 2 TBLSP sugar instead of 1/4 cup. I also used 4 cups wheat flour and 2 cups white. My husband and I loved it! This is going to be a recipe I use a lot! It made 2 regular size loaves (not 3) for me. if I make this in a clay baker, do I use the same temp (350) or use the artisan temp of 425? Has anyone put the dough in the refrigerator after it raises once and make roll or bread the next day? I am definitely going to start up an old tradition with my family with my family-of-friends Amanda and Lauren who both bought new homes this past year, and this wheat bread recipe is what I want to try first once I start it! 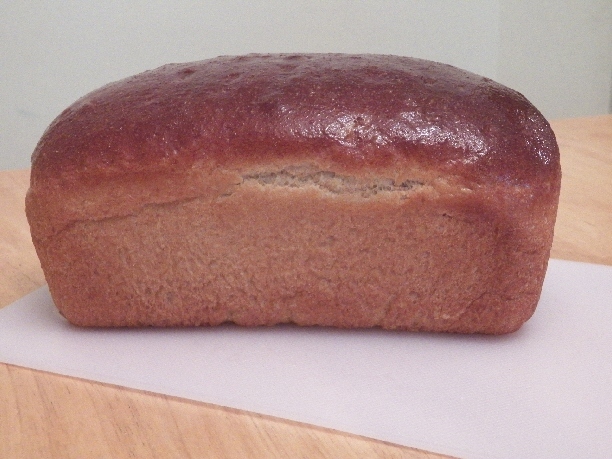 Do you know the nutritional information of the 100% whole wheat Amish friendship bread? This would be great for figuring Weight Watchers Points. Can I make this bread using my potato starter? Hi Glo — We haven’t swapped this with a potato starter since we mostly use the Amish Friendship Bread starter, but others have said they swap the starters without a problem. You just want to make sure you use an active starter for this bread — your starter should be bubbly/foamy and not flat. Let us know how it turns out!